The college baseball season is officially upon us and we were rewarded with some early matchups between high caliber clubs. In both the D-II and NAIA levels games were played between teams in the top three of the rankings and the matchups didn’t disappoint. In each instance it took each team’s best to overcome their nearly equal-abled adversary. When the dust settled there was some slight movement in the rankings, but nothing too substantial this early in the season. At this point results are taken not with just a grain of salt, but a whole heaping of it. While it’s great to see box scores and basepaths once again, it’s important not to put too much stock into early results. It will still take a couple of weeks to see if early results are indicative of overall ability, the result of winter rust or some lucky bounces. Nevertheless, here are the first in-season rankings updates for the small school divisions of D-II, NAIA and D-III baseball. Rankings are based on games through Sunday, February 17. The top two teams have been flip-flopped, and understandably so. North Greenville and Tampa went mano y mano with the Spartans prevailing, 11-5 in Tampa. It could be easily argued that Tampa had an advantage by playing on the home turf, but it really wasn’t that game which put UT over. Instead it was their on-the-road sweep of fifth-ranked Georgia College that gave them the edge. The Crusaders had a heck of series win as well when they totaled 35 runs in a 2-1 series win over Nova Southeastern, so they remain in striking distance of the top spot. West Texas A&M has looked delightful coming out of the gate which spurred the Buffs moving five spots to the No. 16 position. WT tallied double-digit runs in five of their first 12 games. Joe Corbett, a transfer from Arkansas Little-Rock, has been dominating so far this season. In 18 innings on the mound he has only allowed 14 hits and three walks with 30 Ks (15 Ks/9). Continue to keep an eye on St. Leo, the team that was unceremoniously slighted when NCAA postseason bids were handed out last spring. They started the year with a come-from-behind extra-innings win over North Greenville in the season opener and also played top 10-ranked Columbus State tough on the road. The Lions ultimately lost the series to the Cougars, but they battled twice to nail-biting 11-10 defeats as well as roughing up Golden Spike watch list pitcher Kolton Ingram, putting up seven earned runs on the ace in just over five innings. A team not in the rankings, but one that received very serious consideration, is the University of Colorado Colorado Springs Mountain Lions. UCCS started the season winning three of four over Cal Poly Pomona, earned two of three wins over Central Missouri and also won a road series at Point Loma. It’s an extremely impressive start of the spring for a program that is only in its third season of existence. Just as with their D-II brethren, there was a slight change at the top as two of the top teams met on the diamond. The reigning national champions won two of three against Georgia Gwinnett. It would be difficult to write a more exciting script than what happened down in Georiga. After trading wins the first two games, the finale went to extra frames with the Fire capturing the series in the end. The matchup also interestingly featured two of the top players in the NAIA in SEU’s Dan Valerio and the Grizzlies’ Cam Coursey. Both players were included in the USA Baseball Golden Spikes Award preseason watch list. The duo was two of only five non D-I players to make the list. The most dominating start to the season may be that of the USAO Drovers. They’ve started the season 13-1 and have outscored opposition 123-23. While a number of players on the team are worthy of accolades, a special tip of the cap needs to go to Connors State College transfer Luis Pelayo. He is batting .429 to start the season, has scored a dozen runs and leads the team in doubles, triples and RBI. The biggest jump in to the rankings is by LSU Shreveport who started the season unranked but move to No. 13 after starting the year an astonishing 15-1, which includes wins over quality clubs such as Texas Wesleyan, Lyon and Friends. Third baseman Payton Robertson, who played in 20 games for Lamar last season, has made an immediate impact on the diamond for the Pilots. He is currently leading the NAIA in hits and total bases and has amassed a .500 batting average in the young season. Despite their 3-9 start, Webber International remains in the rankings. The Warriors had the misfortune of playing three of their first series against the top three teams in the rankings. After splitting with St. Thomas, WIU traveled up the road to play Southeastern. They kept the games close, losing two of three by a single run and had the lead in each of the games after the third inning, but couldn’t come out ahead in any of the three. The Warriors also lost three games on the road to Georgia Gwinnett to end the ides of February. The team should have a significant reversal of fortune in their box scores the rest of the month. Dropped out: Antelope Valley (18), Florida Memorial (25). There hasn’t been much action in the D-III division as 14 of the teams in the Top 25 have yet to take the diamond. Nevertheless an egregious error was remedied this week with the inclusion of the Trinity Tigers into the D-III elite. The Tigers had a daunting start to their season as they played a pair of perennial powerhouses in Cortland and Birmingham Southern. TU emerged from the series with a 4-1 record and scored at least five runs in each of the contests despite facing a cavalcade of formidable arms. Even more impressive is that those numbers were posted with only moderate contributions from the Southern Collegiate Athletic Conference Player of the Year runner-up Rafe Chaumette who excelled over the summer and was on the All-NECBL team after batting a team-leading .362 for the New Bedford Bay Sox. In other notes around the division, Texas Lutheran, last year’s national runner-up, is still firing on all cylinders following last season. 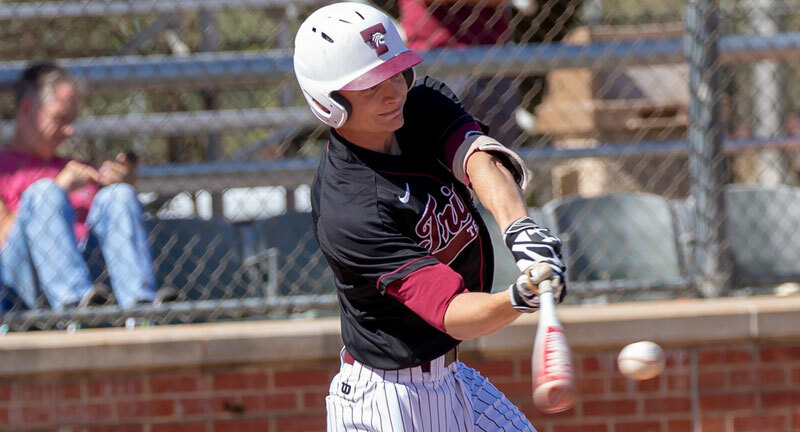 They started the year undefeated with decisive wins over Mary Hardin-Baylor, Hendrix College and Linfield as well as a series sweep of Hardin-Simmons. Misericorida entered the top 10 after taking two from Shenandoah which included a 16-4 manhandling. Chapman’s Nick Garcia was limited to a 41 at-bats last season in which he hit .268. He’s moved to the bullpen this year and has been phenomenal early. In three appearances he’s earned the win in two and a save in the other. In 7 2/3 innings he has struck out 12 with only a single walk and five hits allowed.